JAVADHU HILLS :They consist of bluish gray granites, with peaks averaging 3,600–3,800 feet (1,100–1,150 m). The hills are sparsely populated; the majority of the inhabitants are Malayali tribespeople, though other castes are also present. 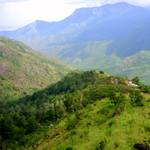 There are many tourist places near Javadhu Hills, e.g., the Beemanmadavu waterfalls. The Indian astronomer Vainu Bappu selected the hills as the site of the Kavalur Observatory (VBO), which began operations in 1967. The town of Vaniyambadi is located nearby.